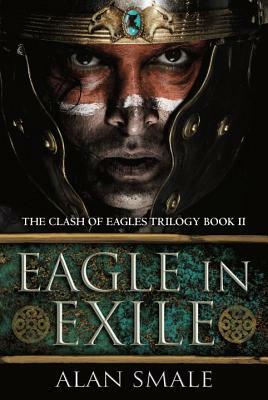 Eagle in Exile picks up shortly after the ending of Clash of Eagles. The Cahokians are picking up the pieces after their battle with the Iroqua, and much of the blame is cast at Gaius Marcillinus's feet. Gaius, continuing to struggle between his Roman past and his Cahokian present, looks for ways to make himself more useful by preparing the Hesperians for the impending Roman invasion. He knows it's coming, and he does what he can to prevent all-out war between the two peoples, despite his very precipitous position within Cahokia. Eagle in Exile functions a lot like a fish-out-of-water world tour, except the world is ancient America. Without throwing out much of the twists in the plot, Gaius finds himself traveling west, east, and south of Cahokia, meeting the people of those regions respectively. They're all given unique treatment, guided by the extensive research Smale has done. Gaius is often accompanied by translator or interpreters, so the language barrier is lower, and we get down to ideological differences faster than we do in Clash of Eagles. It works great to keep the story moving and not bogged down by the semantics of communicating with different people. The story also continues the complicated relationship between Gaius and the Cahokians he holds most dear. The will-they or won't-they between him and Sintikala progresses significantly. The younger Cahokians also continue to gain and lose trust in Gaius as he shows himself to be a very human character. Sometimes he does things that don't make a lot of sense beside "It sounded like a good idea at the time". While I generally enjoyed this back and forth, and the story is punctuated with frequent tension and conflict, the general plot doesn't come into focus until late in the story. It feels a quite meandering and the definition of a "middle book" story. It's just carrying us from the introduction to the (surely) large-scale conclusion. When I was getting toward the end, I finally determined that the current thing threatening Gaius was probably going to get resolved somehow, and it happened to be something that was referenced frequently throughout the rest of the story. There's a definite through-line from beginning to end, but it feels so small and far away at the start that it could've been the plot of the third novel. Though Eagle in Exile suffers middle book syndrome, I'm still invested in this story and will see it through to the end. It continues to be a believable work of alternate history that weaves an interesting story, even if the plot is too blurry at the start to be particularly obvious. It ends on a note that makes the plot of the next book obvious from the start, and I want to see where it goes.